Our committee is in the process of assigning staging locations for the parade and compiling information for related special events taking place on parade day. Please check back closer to parade day for information on related events and to download the official parade program which contains the line of march. Dineout at the White Rose Bar and Grill on Monday, March 25, 2013 (11am to 10pm). 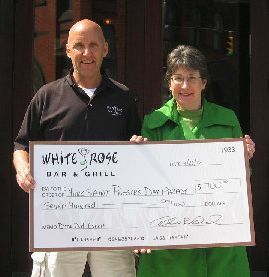 Many thanks to White Rose Bar and Grill for again hosting an annual dineout fundraiser for us. Please mark your calendar for Monday, March 25, and plan to have lunch and/or dinner at the White Rose. When you present a dineout voucher to your server indicating you are there in support of the parade, we will receive 15% of the food sales. White Rose Bar and Grill, located on the corner of Beaver & Philadelphia Streets, has been a leading provider of exceptional food, drinks, and quality dining in downtown York since 1933. For more information about the White Rose Bar and Grill and their upcoming events, please call 717-848-5369 or visit whiterosebarandgrill.com. Dineout at Bair's Fried Chicken on Wednesday, March 13, 2013, 7am to 6pm. 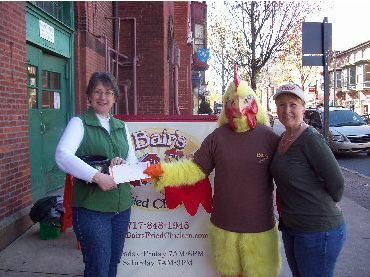 Sincere thanks to Bair's Fried Chicken for planning another dineout to benefit the parade. Watch for details on door prizes and special menu items, and plan to grab a breakfast sandwich on the way to work, stop by for lunch, or pick up dinner on the way home. Every sale counts! Free green beads to the first 100 customers. 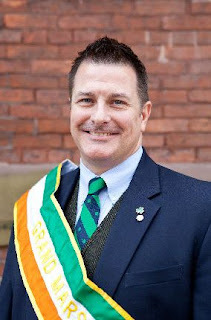 Everyone who stops by is eligible to enter a drawing for four tickets to the Penn-Mar Irish Festival (taking place Saturday, June 15, in Glen Rock). Bair’s Fried Chicken, located in the Central and Eastern Markets, has long provided York County with fresh, never-frozen chicken breaded in its special blend of seasonings, making the “best fried chicken York County has ever tasted.” For more information about Bair's Fried Chicken, please call 717-848-1945 or visit www.bairsfriedchicken.com. View the T-shirt order form here. A discount applies to orders received before Feb. 7, 2013!